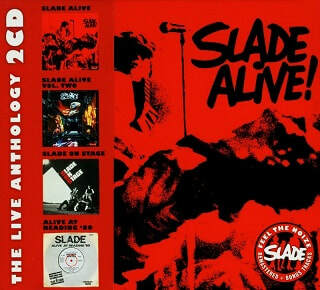 Slade Alive! - The Live Anthology is a two-disc live compilation album, released by Salvo on 21 August 2006. It reached No. 191 in the UK. The anthology includes the band's entire collection of officially released live material, with the exception of the 1982 B-side "Merry Xmas Everybody (Live & Kickin')". Disc one contains the 1972 album Slade Alive! and the 1978 follow-up Slade Alive, Vol. 2. Disc two contains 1982's Slade on Stage and the material from the two 1980 extended plays Alive at Reading and Xmas Ear Bender.